David Pogue, author of Windows 8: The Missing Manual, is deeply immersed in Microsoft's latest operating system. He's ready to share the juiciest morsels of Microsoft's completely reimagined graphical user interface designed to run on tablets as well as PCs. In this live webcast David Pogue provides technical insight, lots of wit, and hardnosed objectivity to help you hit the ground running with Microsoft's new OS. Please join us for this exclusive event. 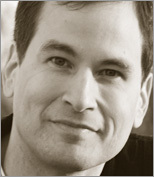 David Pogue, Yale '85, is the weekly personal-technology columnist for the New York Times and an Emmy award-winning tech correspondent for CBS News. His funny tech videos appear weekly on CNBC. And with 3 million books in print, he is also one of the world's bestselling how- to authors. He wrote or co-wrote seven books in the "For Dummies" series (including Macs, Magic, Opera, and Classical Music). In 1999, he launched his own series of amusing, practical, and user-friendly computer books called Missing Manuals, which now includes 100 titles. David's web site is davidpogue.com.